Varadkar homosexual son of Indian immigrant. The Dail has selected a homosexual as Taoiseach. Thirty-eight-year-old Leo Varadkar is the son of an Indian from Mumbai. He is expected to form a cabinet after receiving the Taoiseach’s seal of office later this afternoon. Enda Kenny, who is he has taken over from, has gone to the backbenches. The cabinet is expected to include Mick Ring from Westport. Ring and Sligo’s Tony McLoughlin were among the first to offer their support to Varadkar. Fianna Fail is to remain part of the incoming government under a previous confidence and supply pact. The Soldiers of Destiny apparently prefer to stick with the Fine Gael-led administration fearful that a general election could leave them with still fewer seats. Varadkar has expressed a preference for people who rise early in the morning. 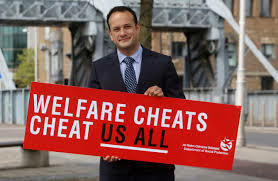 While in Social Protection he ushered in a campaign asking the public to inform his department where they suspected persons on welfare were collecting more in welfare payments that they should. The cross -party Public Accounts Committee later showed there was no basis for the Indian son’s crusade. His action was taken by some to also refer to the State pension and benefits for the most marginalised in the country. He spent a bit of time in health with seemingly little obvious improvement recorded in the service. He slashed millions from the mental health budget. Hospital waiting lists rocketed. He has advocated outlawing strikes in essential services, something it’s felt could very quickly prove the undoing of his adopted government. Kenny from Castlebar will be remembered locally for his leadership of a government that left the West and North West in the economic doldrums. There have been few if any announcements of investment is new manufacturing industry, all while this last few years major production operations have been restricted to Dublin, Cork and a small number of other locations. Roughly 30% of Sligo’s commercial units are idle, numerous others have changed hands. Farming is in crisis and set to get worse – two years after Simon Coveney as Minister for Agriculture told farm leaders at a dairy filled breakfast in the Department of Agriculture of an upcoming era of prosperity and jobs for the dairy industry. Young people continue to exit the region in search of employment on a massive scale. Even political appointees are leaving. In April, the Chairman of the Western Development Commission Paddy McGuninness contacted Junior Minister Mick Ring requesting not to be considered for reappointment. Reportedly he took the decision because he believed that there was no commitment at either political or administrative level to balanced regional development nor was there any worthwhile plan to redress rural decline. well, the decriminalisation of all drugs, including heroin, cocaine and cannabis, is outlined in the forthcoming Dail National Drug Strategy. In case people have forgotten, Sligo-Leitrim has four TDs. They are Tony McLoughlin (Fine Gael) Sinn Feiner Martin Kenny and two Fianna Failers, Marc MacSharry and Eamon Scanlon, the party’s shadow spokesman on small business and the likes. Varadkar’s partner is Matthew, a Mayo man from Erris. Currently, long-term economic prospects for the country have a distinctively sickly look about them as the Oireachtas stares down the barrel of Brexit following the withdrawal of the UK from the EU, and its implications for the North and the Irish State.